Cynthia Smith and Iris Lin traveled to Washington, DC, to accept the Top Honor Award from The Waterfront Center for the transformation of a contaminated industrial site into a resilient waterfront park that not only serves as a critical link to the Boston Harborwalk and the Neponset River Greenway but also restores the shoreline back to its original form as a salt marsh habitat. Located on the banks of the Neponset River Estuary, the 14-acre Senator Joseph Finnegan Park at Port Norfolk was transformed from a contaminated industrial site into a resilient waterfront park that not only serves as a critical link to the Boston Harborwalk and the Neponset River Greenway, but also restores the shoreline back to its original form as a salt marsh habitat. The site, located along the Neponset Estuary, had originally been marsh land before it was filled in for industrial uses in the mid-1800s. Decades of industrial use—including a lumber yard, a metal fabricating company, and the most recent occupant, the Shaffer Paper Company—had left the land contaminated. According to historical records, before the site was claimed by the state in the mid-1980s, neighbors would chain themselves to chairs to block trucks from dumping hazardous waste at the former marsh area next to their homes. 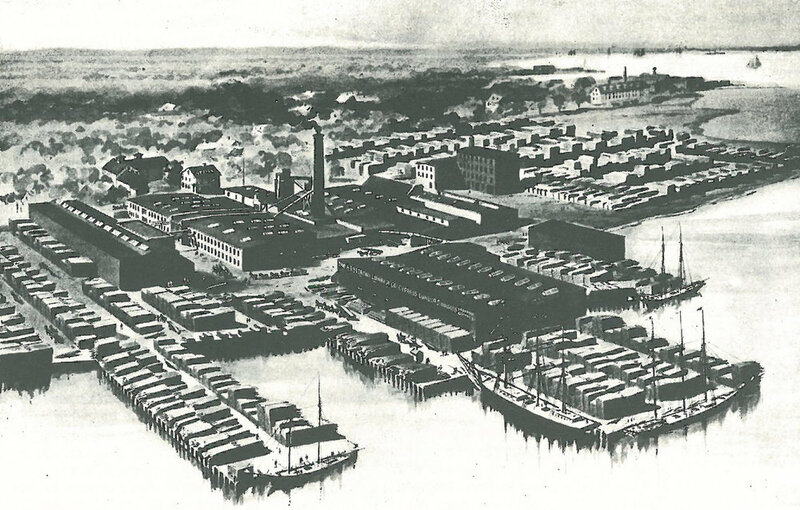 After the factories closed, the Commonwealth of Massachusetts purchased the land. 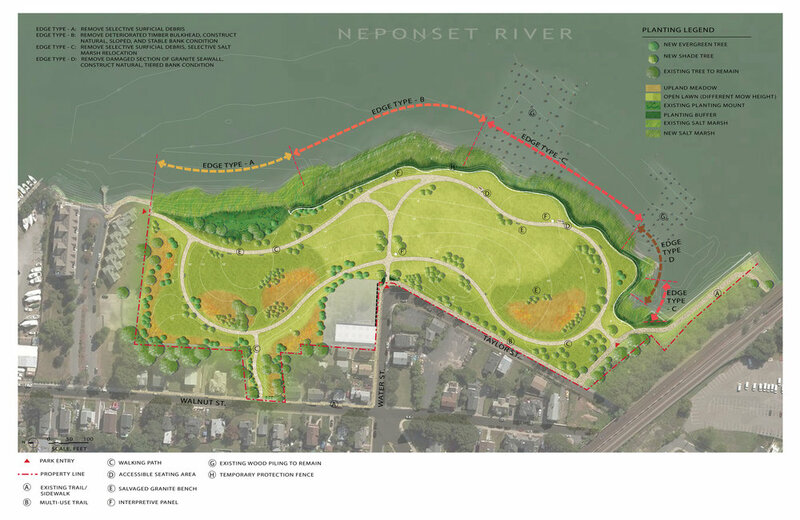 The Massachusetts Department of Conservation and Recreation and the consultant team were charged with designing resilient and sustainable solutions to clean up and restore this ecologically sensitive area and provide a passive recreation space that would allow the public to connect with nature. 1. Stabilization of the natural bank, removal of surficial debris along the shoreline and in the existing salt marsh, removal of the deteriorated timber bulkhead, and removal of a damaged section of the granite seawall. Coir logs and jute/coconut fiber blankets were used to wrap and anchor planting soil while salt marsh plugs were added to establish a new “living shoreline” that replicates the area’s original wetland and provides an important habitat for local wildlife. 2. The excavation and disposal of lead-contaminated soil offsite. Existing pavement and concrete building foundations were broken down for better drainage and remained onsite to minimize the cost of transporting construction waste and were compacted as subgrade. It is estimated that 3,000 tons of waste material was transported out of the site. 3. Development of cut and fill balance: careful analysis and grading that utilized non-hazardous construction debris as fill materials for the subgrade in order to achieve the desired design topography while allowing sufficient imported planting soil to sustain healthy plants. The goal was to minimize the amount of imported planting soil while meeting the soil depth requirement of different planting types. 4. Removal of invasive vegetation and decayed trees, selective preservation of existing trees on site, and the installation of native plants and an upland meadow that are adaptive to the coastal conditions and fluctuating tidal levels. 5. Establishing a green buffer zone with a temporary protection fence along the living shoreline at the upland area, which prevents people from trampling the newly installed salt marsh as it’s being established. 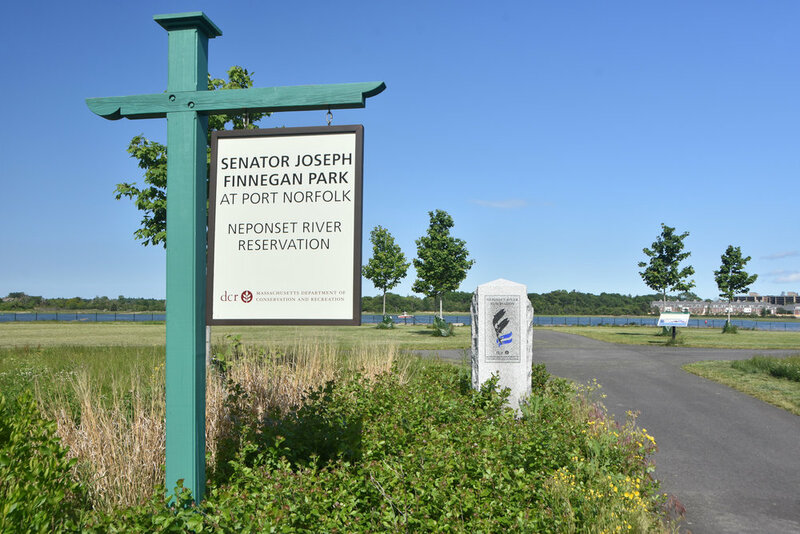 Visitors who come to Senator Joseph Finnegan Park today are able to look out at the Neponset River through an open field with a gentle sloped lawn and meadow, replacing the once-derelict industrial site. A half-mile loop path meanders through the park, connecting to adjacent trails and streets and providing multiple access points for the neighborhood as well as an opportunity to get close to the waterfront. The once paved and decayed bulkhead seawall shoreline was transformed into a natural slope with a salt marsh that serves as an important habitat for wildlife. Contrasting the open field at the eastern portion of the park, the western portion of the site preserved existing trees and land forms. This area is more heavily planted, creating an intimate experience that brings visitors through the woods and offers a glimpse of water behind. Salvaged granite blocks for use as benches are placed along the path for people to use. Three interpretive panels have been installed to tell the story of the settlement history, marine habitat, and industrial development of the site. This achievement, 30 years in the making, was imagined and achieved through the hard work of neighborhood advocates who recognized that natural settings like Finnegan Park are important to the health and vitality of urban families and residents and worked diligently to ensure that this site would become a new community asset. Their commitment to environmental protection and the design team’s expertise coalesced to transform a formerly polluted eyesore into a jewel of the neighborhood that people can enjoy for generations to come.